If you are looking for the best sugar cookie recipe that makes the perfect cut-out cookies, look no further! It is that time of the year when cookie baking is in full swing. This is the best sugar cookie recipe for cut out cookies. There are a ton of things to get done and little time for errors. There are cookies to be baked, parties to attend, and of course shopping and gift wrapping that must be done. So when I decided it was a great idea to host a cookie swap party, I knew that it was time to pull out my best sugar cookie recipe. This truly is the best sugar cookie recipe because it never fails me. I always end up with perfect cut out cookies when I follow this recipe. But in order for your cookies to hold up, not spread out, and to have sharp edges, you must not skip the process of chilling the dough. Be sure to cream your sugar mixture until it is fully incorporated. I have tried other sugar cookie recipes that claim that no chilling of the dough is required. And yes, you can definitely make cut-out sugar cookies this way. But if you want the best sugar cookie recipe, the dough needs to be chilled. What happens if you skip this crucial step? Be sure to chill your dough in a long roll or a large disk shape before rolling it out. 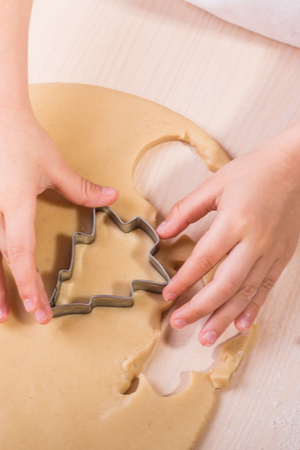 First of all, when you go to cut out your cookies, the warm dough will compress around the edges. And when put in a hot oven, the dough will begin to spread out. This is when your cut out cookies no longer look like they are supposed to. I know there is little time to waste this time of year. Every hour, minute, and second is vital. That is another reason that this is the best sugar cookie recipe! 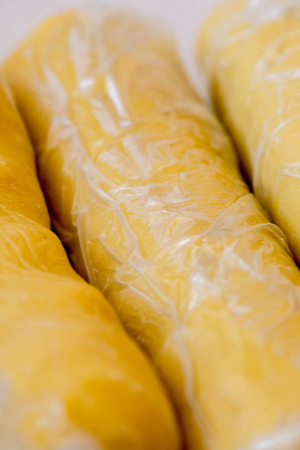 Once you remove the dough from the refrigerator you can roll it out. No need to wait around for an hour while the dough is in the refrigerator cooling. Just put it in the refrigerator and come back to it when you are ready to bake. The dough will last up to 3 full days and still be good to bake as the day that you prepared it. Is Freezing The Cut-Out Cookies Necessary? After you roll out the dough and cut out your cookies, it is recommend that you freeze the individual cookies for 10 minutes prior to baking. After you cut out the cookies, freeze them for 10 minutes prior to baking. 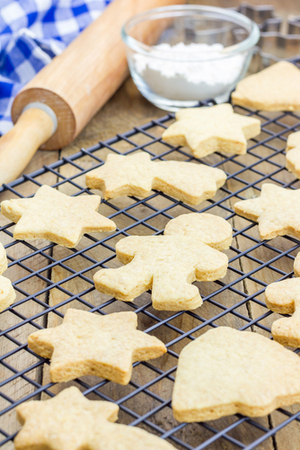 Although your cookies won’t come out as a disaster if you don’t follow this step, it is vital to achieve the best sugar cookie status. The freezing process will help the edges of the cut out cookies remain sharp. It is natural for the edges of the cookies to become compressed after being cut out. By placing them in the freezer, the edges tend to bounce back and retain the desired shape. One last and final step in making the best sugar cookie, the cooling process. Be sure to allow the cookies to cool completely before icing. It is best to leave the cookies sit on the baking sheet for a few minutes before transferring them to a cooling rack. This allows the cookies to complete the baking process and firm up into its final shape. Then use a large enough spatula to support the entire cookie when moving it to a cooling rack. And of course, let them cool completely before icing them. 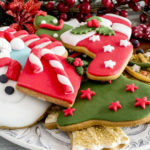 If you don’t have time to put your favorite icing on right away, these cookies can be stored in the refrigerator or even the freezer until it is time to decorate! But if you don’t have time to make these cookies, you can still impress your friends with our classic Toffee Bars recipe. And don’t forget to serve these cookies with Homemade Eggnog – they make the perfect holiday match! The absolute best sugar cookie recipe that makes your cut out cookies bake up perfectly! 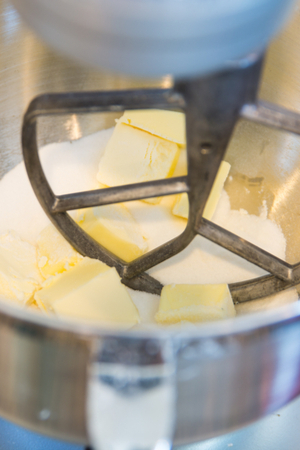 In a large mixing bowl add butter and sugar and beat until fluffy. Add egg, milk, and vanilla and beat until combined. Slowly add dry ingredients until well incorporated. Shape dough ball into a large disk shape and wrap in plastic and refrigerate for at least 1 hour and up to 3 days. When ready to make the cookies, preheat oven to 350 degrees F and line two baking sheets with parchment paper. 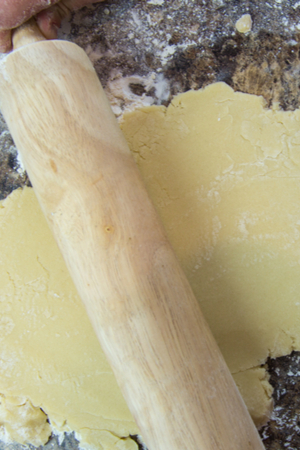 Lightly flour your work surface and roll the dough to 1/8” thickness. 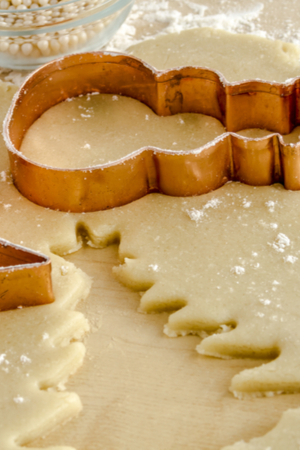 Using cookie cutters, cut out the dough and transfer each one to a prepared baking sheet. Freeze for 10 minutes prior to baking. Bake for 8-10 minutes or until the edges are lightly golden brown. Let the cookies cool on the cookie sheet for 3 minutes prior to transferring to cooling rack. Let cool completely prior to icing. The amount of cookies that you will get from this recipe will depend on the size of your cookie cutters. It will typically yield approximately 3 dozen medium size cut out cookies.